A dinosaur on wheels… a Cadillac covered in Legos… a tie-dyed school bus… if you see all of these rolling towards you, it doesn’t mean you’re stuck in a surrealistic dream – it probably means you’re watching an Art Car Parade! An art car is a vehicle that has been transformed through the magic of paint or found objects, and a healthy dose of creativity, into a mobile objet d’art. 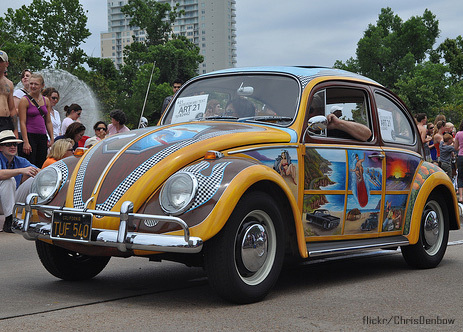 First originating during the hippie movement of the 60s, the art car phenomenon is still alive and well today. Annual Art Car Parades take place in cities such as Houston, Minneapolis and San Francisco, and also feature prominently in festivals such as Burning Man. Houston’s annual Art Car Parade draws nearly a quarter of a million attendees, testimony to the popularity of these wacky and wonderful automobiles. 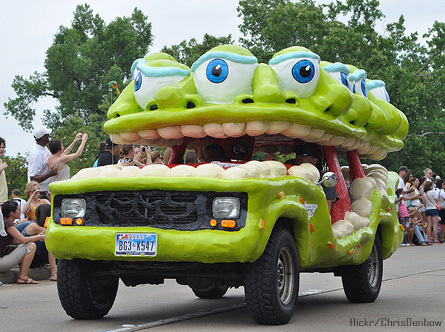 “Mutant vehicles” are the more radically-transformed cousins of art cars (as shown above). Mutant vehicles refer to cars that barely resemble our common conception of what a car should look like, because they have been transformed into whimsical mobile creations, like giant red wagons, hot dogs, monsters and even cathedrals. Artist and non-artists alike have taken to decorating their cars. Those who don’t consider themselves “traditional” artists embellish their cars by covering them entirely with bumper stickers, pennies, Astroturf, Legos, and Barbie Dolls. Fine artists can show off their painting skills by creating detailed and elaborate murals on their cars, usually using enamel or airbrush. For artists, an art car is an excellent way to show off your art because it becomes a mobile gallery, turning heads on the highway and in parking lots. If you have an art car or decide to transform your car into one, make the most out of the free publicity by adding a bumper sticker with your website address, or by painting your name and website URL somewhere prominent. This entry was posted in 3-d sidewalk art, Art, Art Basel, art car, Brief Definition of Art History, cars, Chanukah, China and India, Christmas, Claude Monet, dinosaur, eccentric, English, Football, Football Monday, French, Game, God, Hanukkah, Happy New Year, Impressionist painting, John Singer Sargent - American Portrait Painter, Joseph Mallord William Turner, Kids Christmas Art, landscape painter, legos, Miami, Mona Lisa, Monet, Online Paint by Number, Paint by Number kits, Paintings, parade, Patterns, pavement art, Pop Art, Puzzle, Recycling, school bus, Segmation, shipwrecks, Sidewalk art, Snow, Snow patterns, Vincent Van Gogh, wacky, Western Culture, What is the meaning of Christmas, Zodiac and tagged Art, brain teaser, Color by Number, easy, gift, masterpiece, online, online paint, Paint, painting, Segmation on December 24, 2010 by segmation. I think it is amazing as well! Thanks!